As with all advanced improvisation, Smith’s was never an unmodulated, let-it-all-hang-out, instinctual process, but rather a mixing of careful planning with retrospective and prospective painterly performance—an act of looking back (in time or space) and looking forward at the painting. 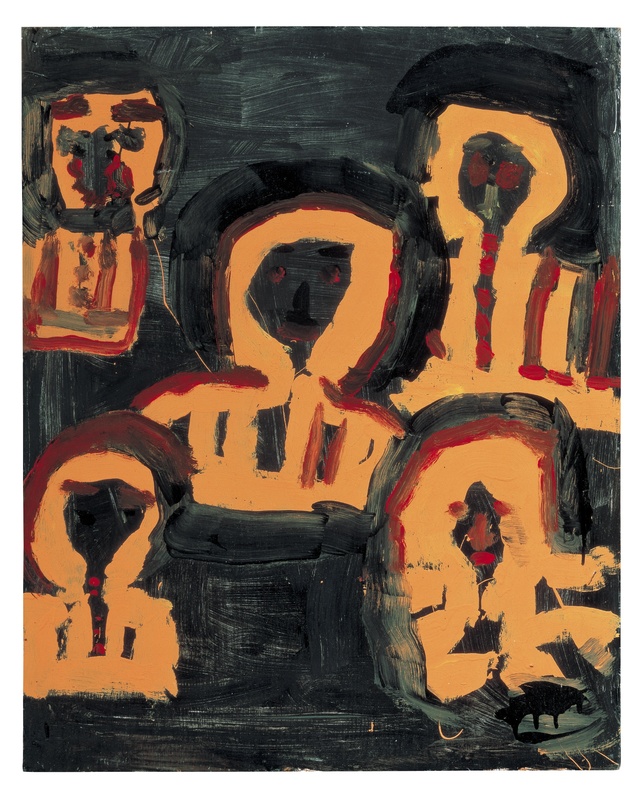 One untitled work contains sequential applications of black paint, then orange, then more black, and then red paint. Their effect restrains the orange, the piece’s most aggressive color. A resulting tension between the black and the hot colors is tightened by the use of black both to underpaint and to partially efface the orange figures. Notice as well that all five faces’ features are created with different combinations of colors.